The Pioneer Street Rail Overpass, when completed, will provide safe access to and from the waterfront for motorists and pedestrians. 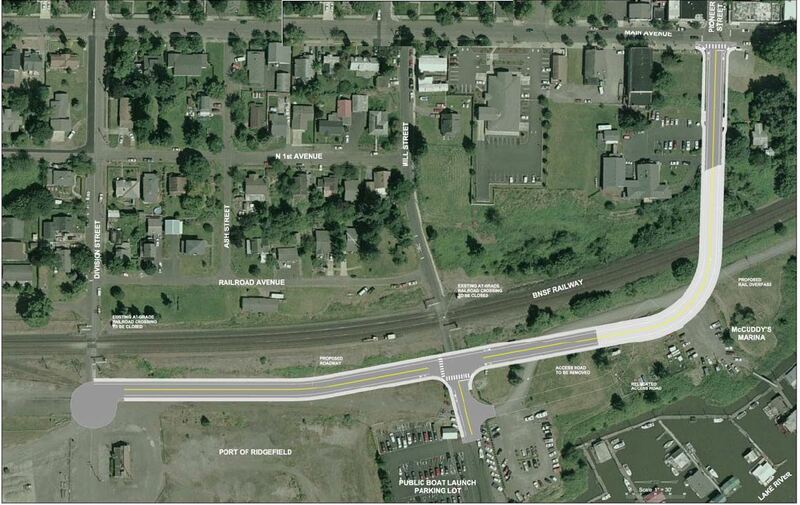 In the first quarter of 2019 The Port of Ridgefield will go out for bids on the final phase of the Pioneer Street Rail Overpass project – the aerial span over the railroad tracks. The span will connect to the north and south approach roads built by the port earlier in two separate phases. Construction on the final phase is estimated to begin in 2nd quarter this year. The final phase includes the already- completed design and City of Ridgefield permitting for the project. 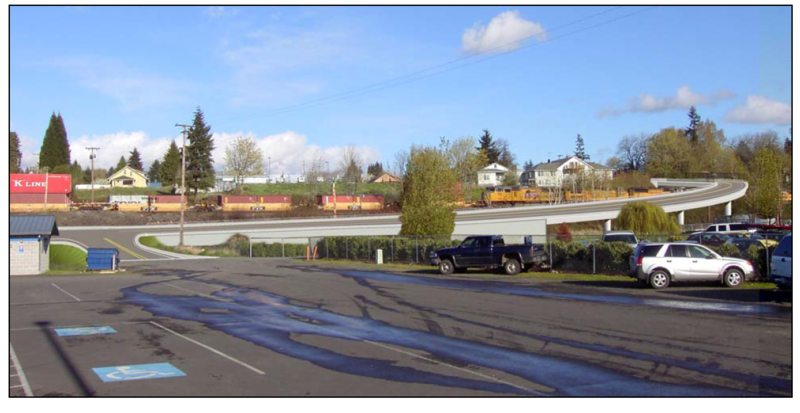 In the early 2000s, the Port of Ridgefield envisioned and began its effort to secure the funds required to construct a rail overpass at Pioneer Street. 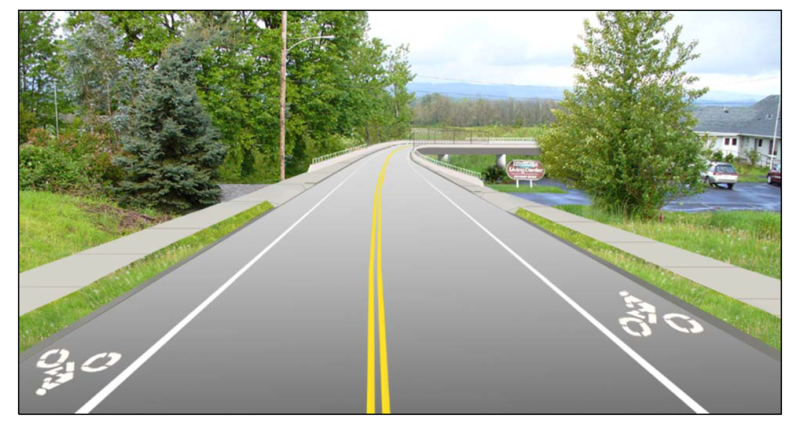 When completed, the overpass will provide safe and guaranteed pedestrian and auto access between downtown Ridgefield and the waterfront, including the port’s 41-acre mixed-use development site. The aerial view illustrates the Pioneer Street Rail Overpass and the future route over the railroad tracks that will provide safe access to and from the waterfront for motorists and pedestrians. Phases 1 and 2 were completed in 2013 and 2014 respectively. The final phase was due to start summer of 2017, but was delayed pending approval by the Washington State Department of Transportation and Burlington Northern, the rail line operator. An additional delay occurred in the spring of 2018 when the port was required to conduct a new wildlife environmental impact study due to the presence of White Tail deer – a threatened species – in the nearby Ridgefield National Wildlife Refuge. Funding for the $11.3 million overpass project has come from several sources. In 2015 the port secured $7.8 million in state funding, $2 million in federal Surface Transportation funding through Southwest Washington Regional Transportation Council (RTC), and in early 2017 the port was awarded $900,000 from a U.S. Department of Transportation Railroad Safety Grant. The remaining dollars for the project were provided by the port and others.